Ah, Vilnius! Who would have guessed? 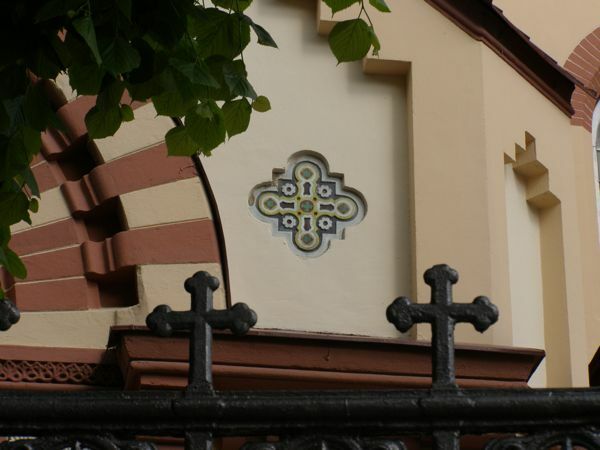 I just returned from a whirlwind tour of Vilnius, Lithuania. I know—“Where the heck is that?” you ask. It’s south of Latvia, west of Russia, and borders on the Baltic Sea. My niece Laura drew me there; she’s at the Vilnius University on an exchange from Melbourne. Laura had said Vilnius was lovely, but I wasn’t prepared for what awaited me. Especially after the circus in Moscow. I took a night flight (duh! ), punctuated by a full three hours of being confused, ushered, hushed, and told to wait—by no less than 9 different Moscow airport employees (plus one chauffer). The long and short of it is that in spite of NO smiles or clear communication, I made it from my first flight to a connecting flight to Vilnius. WHEW! I could definitely feel the influence of many years of a communist regime. Inefficient would be an understatement. Anyway, Laura met me at the Vilnius airport, and after a HUGE warm hug, I was ready for adventure. I’d shown Laura Istanbul, and now it was her turn to play tour guide. She was good! After dropping our things at our hotel, we were off! Laura led me through the winding streets of old Vilnius, one of the largest surviving medieval cities in Northern Europe. (According to Wikipedia, its 70 streets and lanes cover 887 acres and encompass 1487 buildings.) It’s an amazing conglomeration of buildings in gothic, renaissance, baroque, and neoclassical styles—amazing! Vilnius University, where Laura is studying, is a formidable complex over 400 years old. Imagine! Our first stop was breakfast (late) at Laura’s favorite teahouse, Skonis ir Kvapis (Smells and Tastes), tucked neatly inside a courtyard. 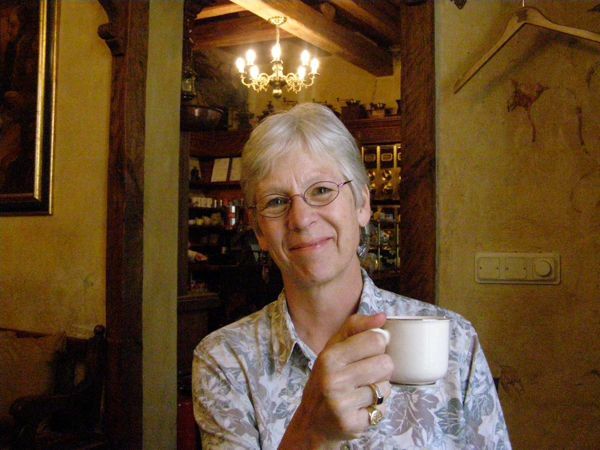 This charming restaurant with its foot-thick walls, vaulted ceilings, and antique décor was the perfect spot for us to unwind, reconnect, and plan our four-day weekend together. It’s hard to say what were my favorite things—there were many! 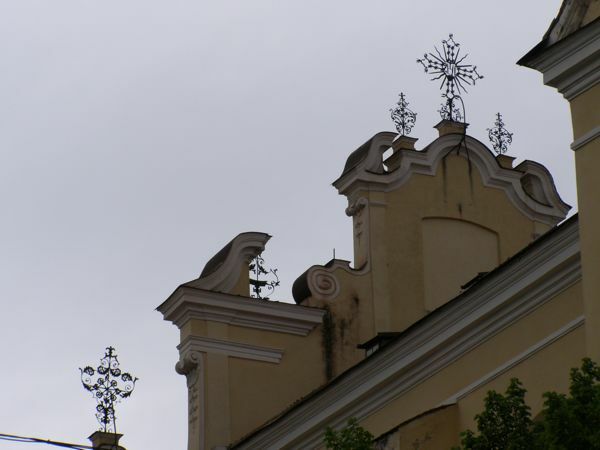 The beauty of Vilnius is that it’s yet an undiscovered gem: tourism has not yet engulfed the city—but it will. Vilnius clearly rivals Prague in both beauty and charm, yet it’s FAR cheaper and more provincial. 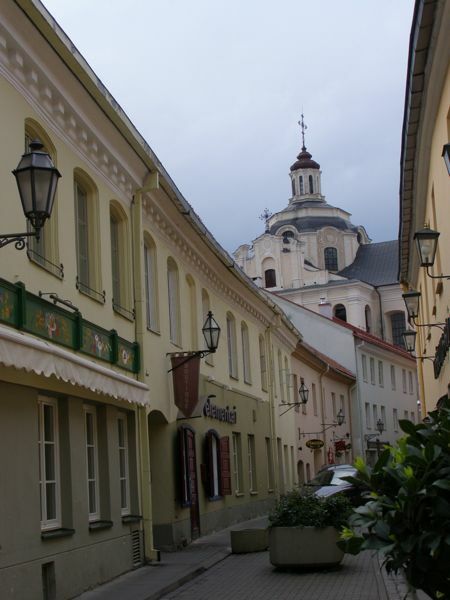 The city has a population as small as 300,000, half of which must live and work in the Old Town. 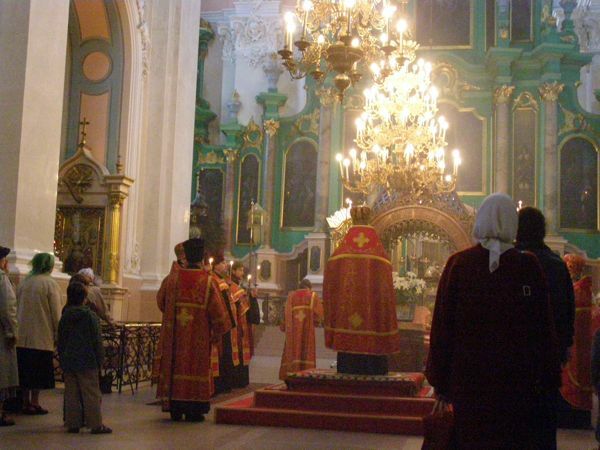 Saturday evening we stumbled into a Russian Orthodox service at St. Nicholas’ Church, just blocks from our hotel. The religious fervor of the participants was awe-inspiring, though not suprising in a country where religious worship was prohibited by the communist party for over 50 years until 1991. Crystal clear choral voices swelled from above as the priest infused his dimly-lit sanctuary with incense. 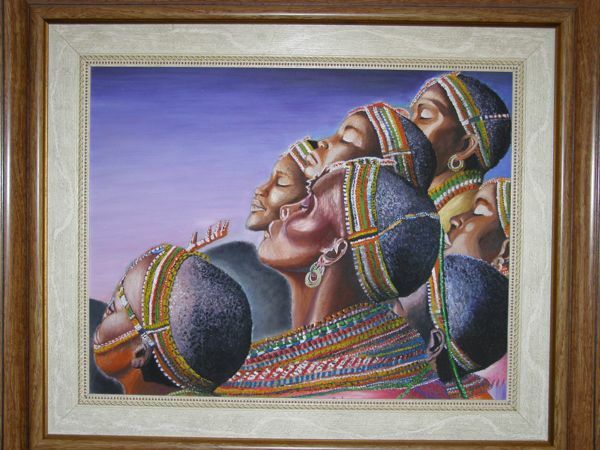 There were a good many crossings and bowings by the standing supplicants, men and women of all ages. 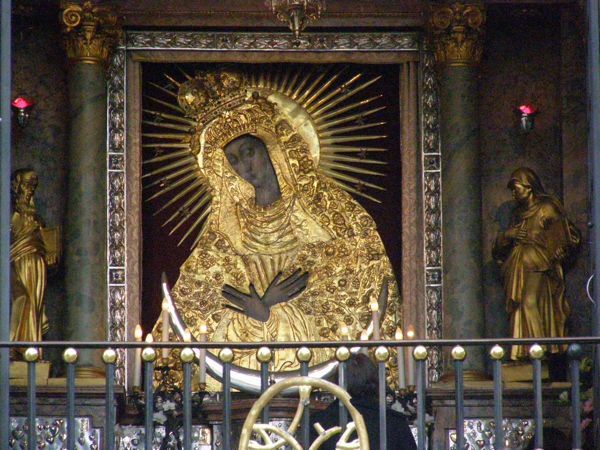 The decorations in the church were impressive—many obviously precious religious relics. Next our meanderings brought us to St. Theresa’s Catholic Church, a baroque affair where young children in white robes must have been receiving their first communion—a celebration we’d seen evidenced both Saturday and Sunday all through the city. Laura then led me to the Gates of Dawn, the last existing gate (of ten) to the city. 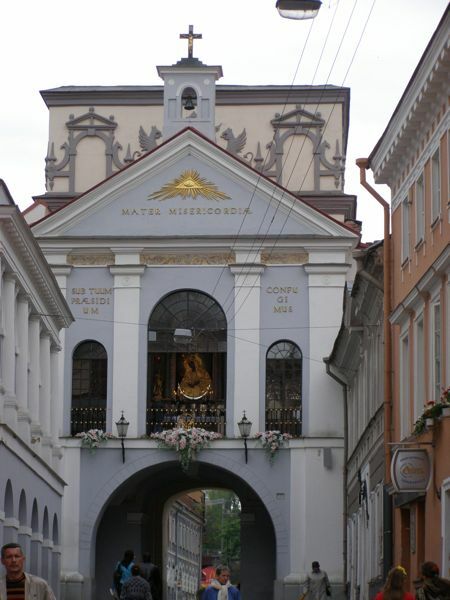 Over the gate is a small chapel with a famous gilt icon, The Blessed Virgin Mary Mother of Mercy, which dates from the early 17th century. 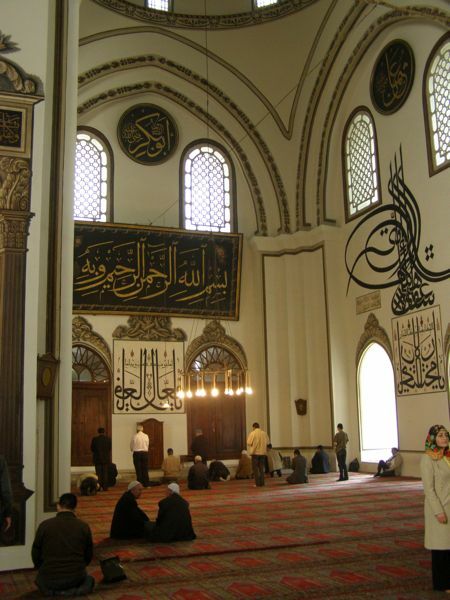 As people pass under the gate, they often turn to cross themselves in homage to this holy shrine. 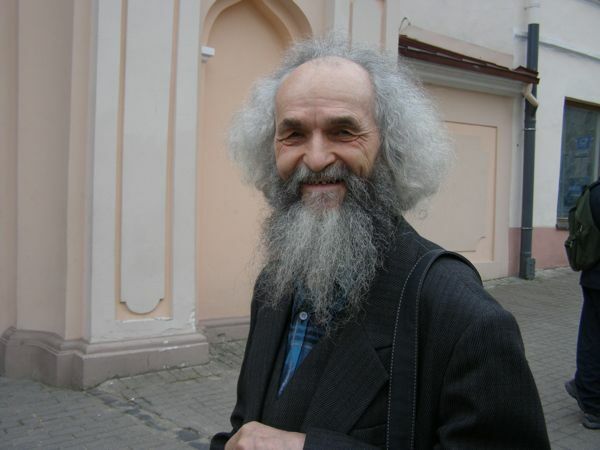 After giving some change to a beggar, we were approached by a friendly, bearded Russian who invited us to a nearby monastery. Who were we to refuse? We were treated to yet another service in an extravagant baroque cathedral, the likes of which I’ve never seen. 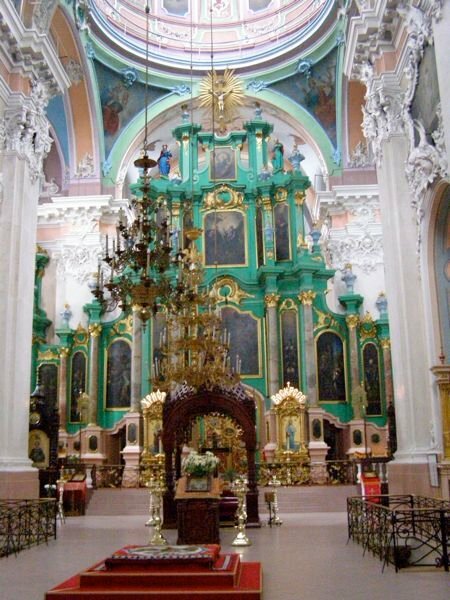 The entire frontpiece was a flowing, gilt-edged green with three ornately gilded gates, behind which stood the altar. The entire sanctuary was filled with icons, paintings, and shrines, many of which are valuable religious treasures. 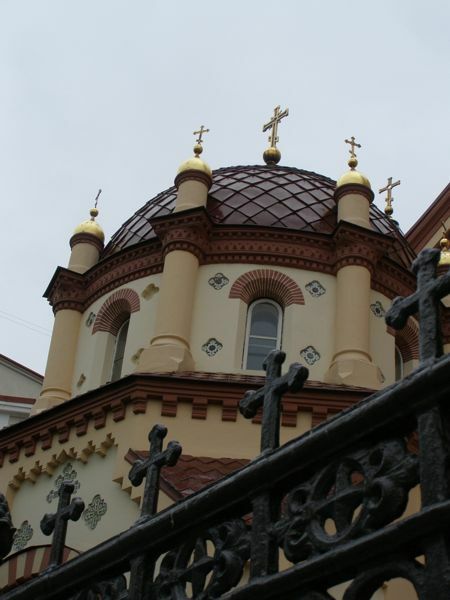 I later learned that it was The Church of the Holy Spirit, the major Russian Orthodox Church of Lithuania. Its importance was evidenced by the seven red-robed priests who officiated at the service. I must apologize for the fact that I surreptitiously snapped a few photos before I saw a small sign (the next day) saying “During the Divine Service, walking, talking, and taking pictures inside the church is not allowed.” Oops. I’m sorry. I hate to be disrespectful. Laura and I also attended a concert that twice moved me to tears: the first during “Orawa” by Polish composer, Wolciech Kilar, and the second during George Gershwin’s “Rhapsody in Blue,” which I’ve always loved. The Vilnius Symphony Orchestra is incredible. 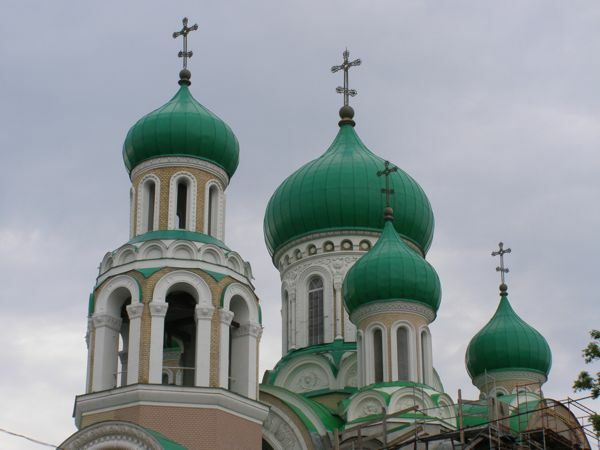 Another memorable experience was our hike to the Church of St. Michael and St. Konstantine, an onion-domed church (with bright green domes) built in 1913 to commemorate the 300th anniversary of the Romanov Dynasty. It was pretty cool, as well as a lovely walk. We even passed a monument to Frank Zappa. Go figure! My final adventure was a climb up a narrow winding staircase to a tower above the Vilnius University Library. Laura had been brought up there on a tour, and she led me up into a tiny tower for a spectacular view of the city, even more interesting than the view we’d had from the Vilnius Castle Tower. Oh, there were countless wonderful things we saw and did—too many to note. All I can say is that I’m confident Vilnius is close to being one of Europe’s favorite tourist destinations. I’m just glad I got there when a beer was still under two dollars. After waving my own precious houseguests goodbye last weekend (Pat and Phil Kruse— lovers of history, adventure, good food, and rakı), I headed south. I spent the weekend with a Turkish family in Gemlik, a city nestled in the mountains north of Bursa on a picturesque bay of the Sea of Marmara. My young friend Uygar Yilmaz’s parents, Neziye and Hakki, have a charming apartment perched on the hill overlooking the sea, and they showed me the best of their community, their family, and Turkish cuisine. I may never eat again! It took me longer to get there than I’d hoped—five hours to travel 60+ miles (105 km). Well, the long and short of it is that after a bus ride, a ferry ride, and three more bus rides, I finally got to Gemlik. My hosts were worried about me, expecting I’d arrive hours earlier. No matter—we sat down to a 10:00 (delectable) dinner of çorba (soup), dolma (stuffed vegetables), fried artichoke hearts, salad, bread, and dessert. Oh, MY! I felt a bit like the dolma I’d just devoured. Neziye entertains us with her ud, her songs, and a poem about her sons. 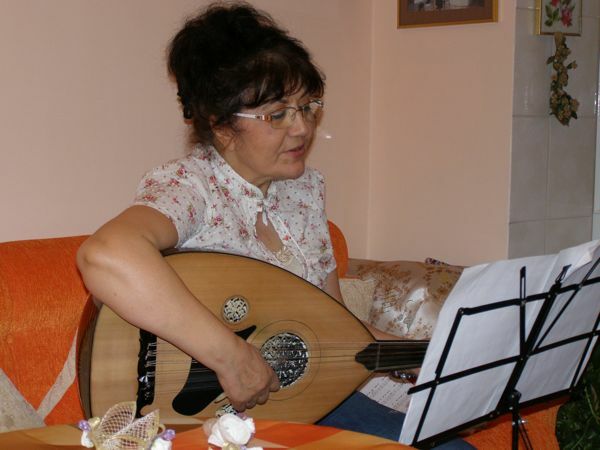 After marveling at Neziye’s incredible artwork, wearing Uygar out translating for us, and being serenaded by Neziye singing and playing her ud (a rounded 10-stringed instrument), we finally headed to bed in the wee hours. From there we drove to the workshop of Dr. Tankut Öktem, a famous and recently deceased sculptor. An impressive collection of bronze-looking statues line the roadside, nestled in the trees. Students continue his work, and inside the warehouse-sized workshop they were building a huge fiberglass image of Ataturk’s face—probably 15 feet across. 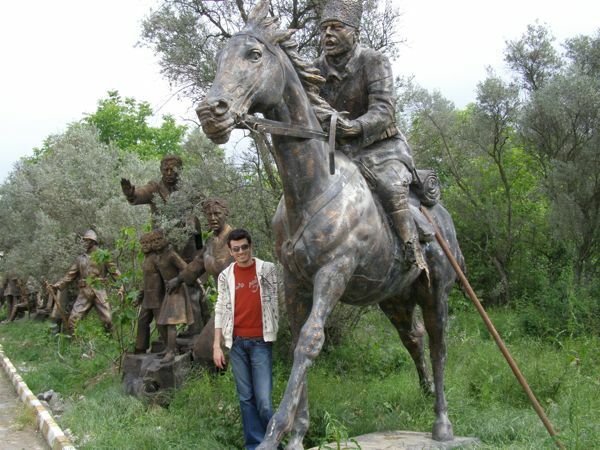 Uygar poses next to one of Öktem’s many sculptures. Next we drove up to Umurbey, a small mountain village above Gemlik. There we visited an outdoor restaurant where each table is housed in its own small cabin perched on the side of the hill, complete with a built-in mangal (barbecue). We could see for miles in every direction. Further up the mountain Neziye and Hakki have land with fruit trees, olive trees, and a small garden. Retired teachers, they’ve always had time off in the summer to tend their garden. 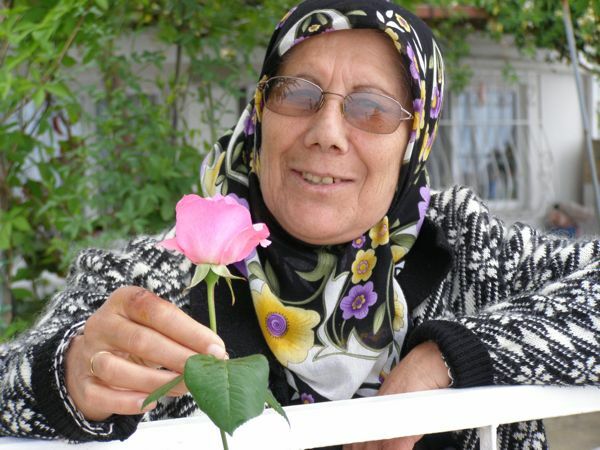 (Teachers can retire in their 40’s in Turkey—with an unenviable pension.) Uygar said that most Gemlik residents have a plot of olive trees on the mountain. Uygar and I then hopped on a bus to Bursa, where I got a royal tour. We saw the Silk Han (Koza Han), the Great Mosque (Ulu Camii), the Covered Bazaar, the Green Mosque (Yeşil Camii), and the famous tombs and clock tower on Tophane, a lovely citadel that overlooks the entire city. Let me tell you, by the end of the day we were BUSHED! Luckily, my grey hair got me a seat on the bus for the long ride home. (Uygar’s mother had advised me to grow out my hair and dye it. And stand on the busses? No, thank you!) 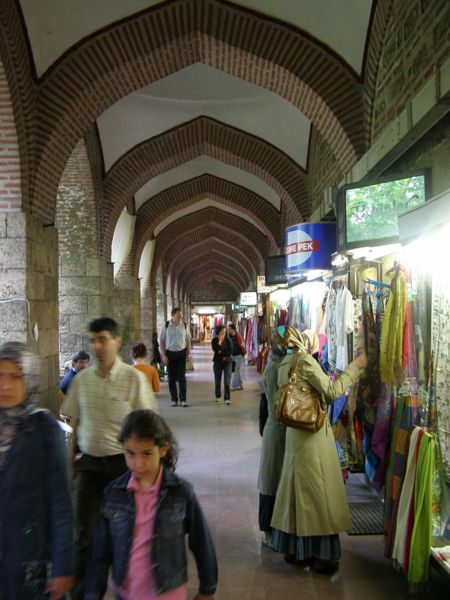 I was surprised to see that the vast majority of women in Bursa were scarved. Much different than Istanbul! Neziye had a delicious meal waiting for us when we got home, after which we rolled ourselves into bed. What a day! After breakfast, Uygar and I took a long stroll along the waterfront, then returned home for yet another impressive Turkish meal, this time with friends. (I tried to keep up with their Turkish conversation, but fell dismally short of comprehension). Then, a bus ride home, thanks to Hakki’s fast talking. He was a real hero, given the waiting crowd and only one open seat (which I got). Turkish busses are nicer than Greyhounds; the inside is more like an airplane than a bus, and a steward (quite handsome, dressed in white shirt and tie) serves soft drinks and tea with cookies or cake. The only problem is that there’s no rest room, so you have to hold it. Luckily, there was a rest room on the ferry. Whew! Otherwise busses make a rest stop every three hours or so. It’s a matter of careful planning (which I often forget). Well, there’s my weekend Banging around Bursa with the Yilmaz family. Istanbul is about people, about history and about—yes, WATER! This may be the only major city that is both divided and surrounded by water. The Sea of Marmara borders Istanbul on the south, while the Bosphorus divides the European side from the Asian side, connecting to the Black Sea on the north. The European side of the city is divided into two more sectors by the Golden Horn. Water, water everywhere. The dilemma this creates, though, is transport. This city of over 11 million people has continuous comings and goings, and less than a fourth of its residents own cars. 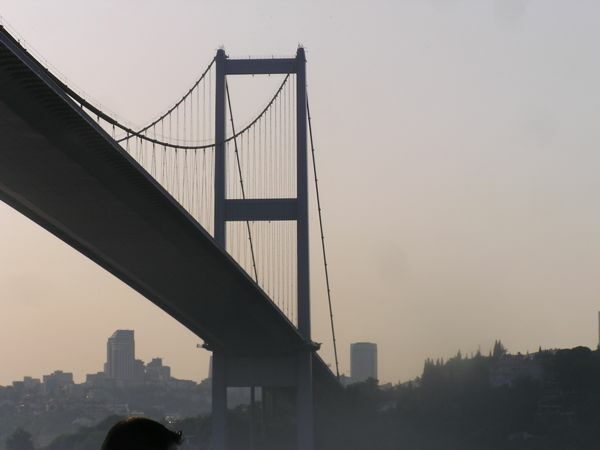 Two bridges span the Bosphorus, connecting the two continents (in a veritable traffic nightmare), while an intricate system of ferries totes the majority of commuters across the water from one side to the other. It’s also a great way to bypass the traffic jams that plague Istanbul. 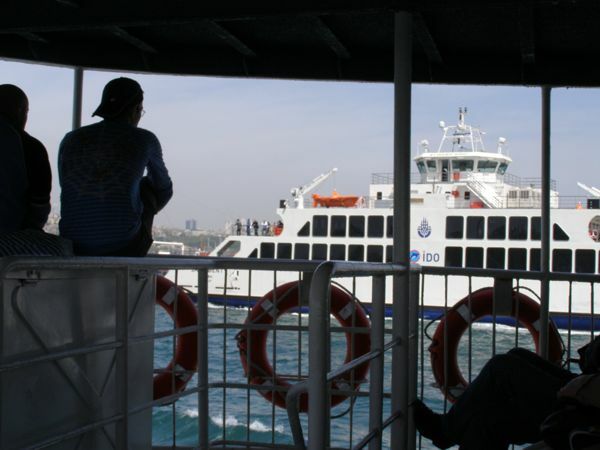 Having spent my first two years on the Asian side, I first became familiar with the ferries from Kadiköy. Huge two and three-story ferryboats cross the Bosphorus about every half hour to Eminönü (the historical European side—Sultanahmet and the Grand Bazaar), with others heading to Karaköy (across the Golden Horn from Eminönü). Those ferries carry anywhere from a few hundred to a few thousand people. Two weeks ago I rode one with a mob of fans after a Fenerbahçe match—what a rush THAT was! 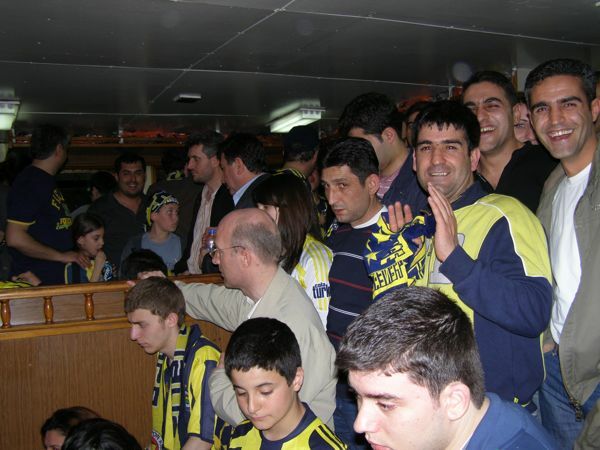 Fenerbahçe Fans fill the ferry–happily! 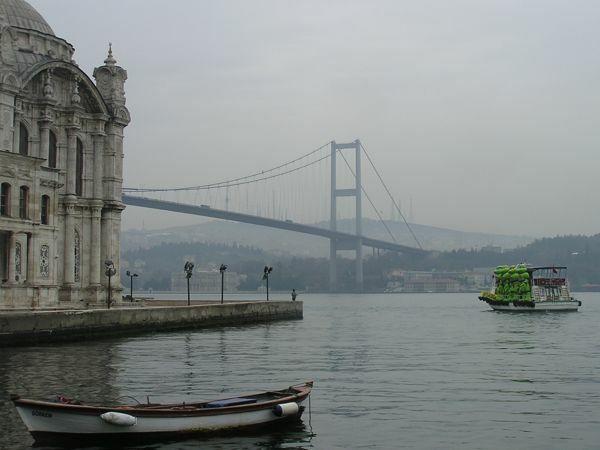 27 ferry stations serve the Marmara and the Bosphorus, with additional fast ferries serving points around the busier spots. 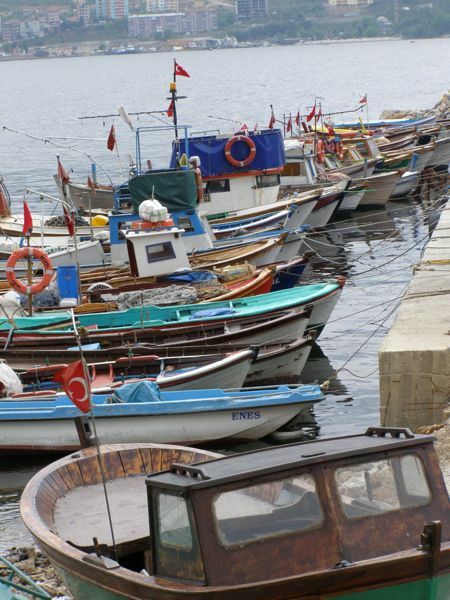 You can also hire a water taxi, though I’ve only managed it once after missing the ferry from Eyup (near the end of the Golden Horn). 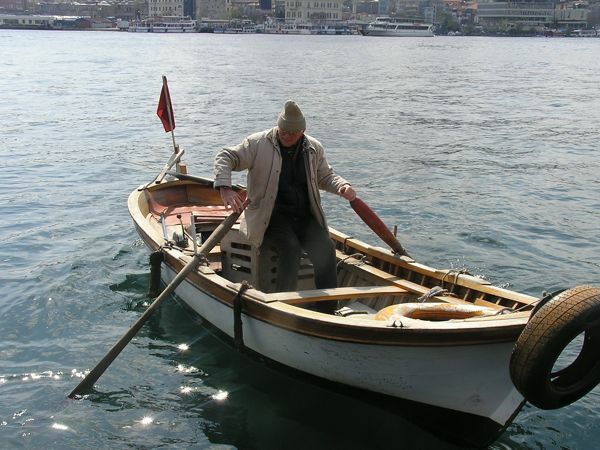 My friends and I would have missed a Whirling Dervish performance, so we hired a little wooden skiff-taxi that I’m convinced was propelled by an inboard lawnmower motor. We arrived at our destination safe, though a bit chilly. 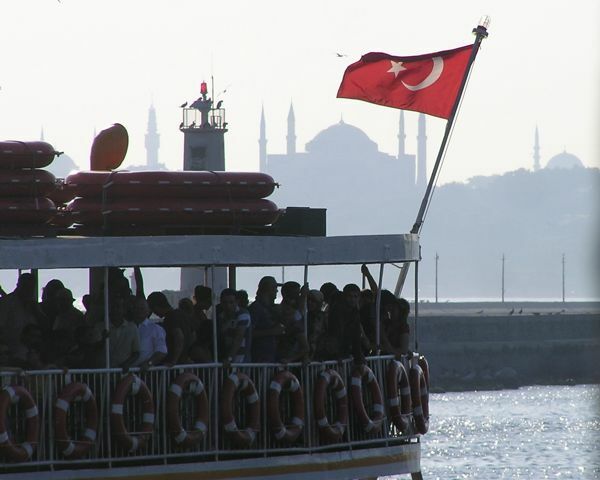 A ferry ride across the Bosphorus can be a lovely experience, particularly on a warm, sunny day. The ferry offers outside seating on benches along the perimeter and more outdoor benches at one end of the upper level, though the majority of the seating is inside. There’s a small concessionary on the second level, with a waiter who circulates throughout the ferry selling tea in glass tulip cups for about 50 cents. 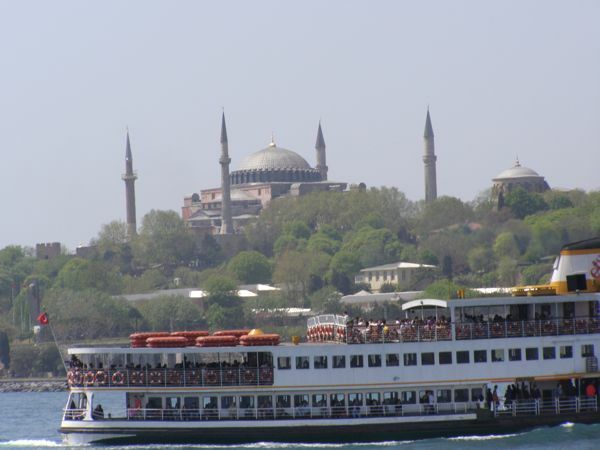 The ride usually takes about a half hour, a chance to relax and enjoy the water, the gulls, and views of Topkapı Palace, the Aya Sofya, and the Süleymaniye Mosque that dominate the city. The dance of ferries as they navigate around each other is amazing; only once did we nearly collide. 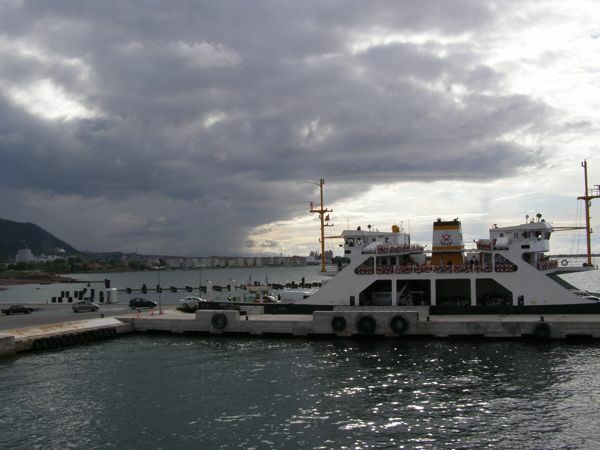 There are a few more modern ferries that cross the Marmara Sea, connecting Istanbul with Bursa and areas to the south. The Marmara (which means “marble”) is about the size of Lake Superior, though significantly warmer (and safer). There has been talk of modernizing all of Istanbul’s ferry boats, but people are hesitant to give up the charm of the city’s old ships. I understand. It would be sad to see them go. The newer ships that cross the Marmara are pleasant, but more like an airplane than a boat. Now that I live on the Bosphorus, I’ve taken ferries from Beşiktaş to Üsküdar, as well as smaller rides between the nearby communities of Bebek and Emirgan. Ortaköy offers a small tourist ferry ride all summer, where for a mere 5 lira you can ride up the Bosphorus to the next bridge and back down, just to relax and enjoy the beauty of the Bosphorus. It’s grand. 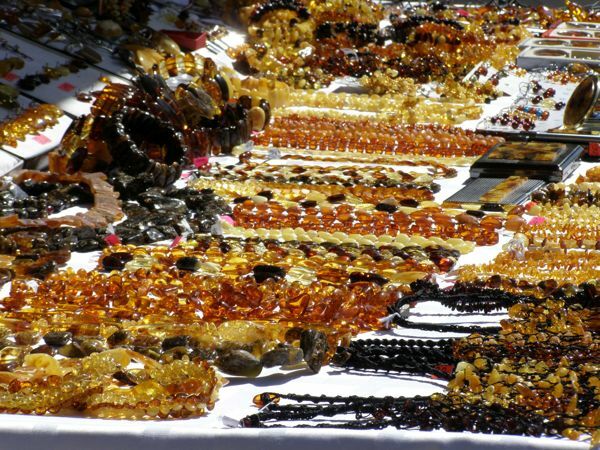 What could be more Turkish than this!